Occasionally, power outages occur. Storms, downed tree limbs on power lines, small animals on the equipment or lines, traffic accidents, underground construction accidents, and equipment failure can result in a loss of power. Whatever the cause, our crews will work to restore your electric power as quickly as possible. To report an outage or a downed power line, call us at 419-633-6100. WARNING: Stay away from downed power lines and warn family and neighbors to do the same. Turn off all appliances to avoid a circuit overload when the power is restored. Go to Consumer Tips for more electrical safety tips. The electric department is continually improving our electrical system. As we make these changes, we notify customers of any necessary outages by placing door hangers on their doorknobs. The door hangers state which area will be affected and the approximate length of time they will be without electric power. We keep a list of infants and adults who are on oxygen or a monitoring system that requires electricity. If you or someone you know is on one of these systems and have not notified the electric department, please call us at 419-633-6100 and we will add you to the list. 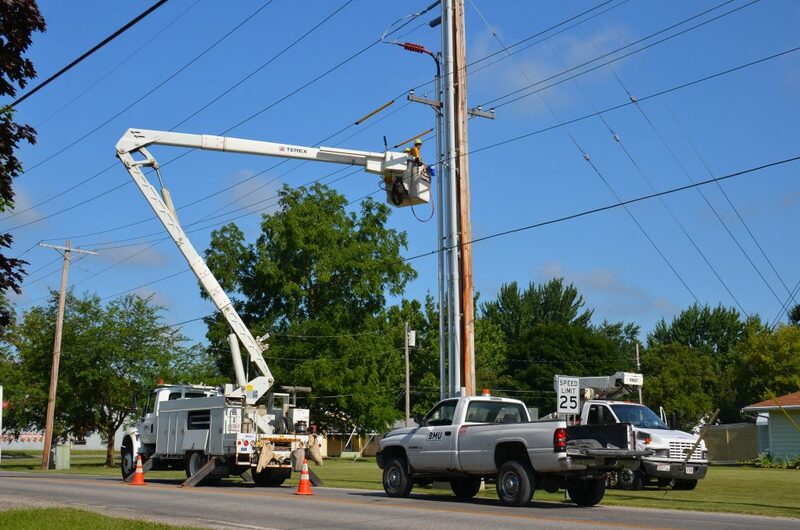 To disconnect electric service to make repairs, please call the Utility office at 419-633-6110. There is no charge to turn service off during regular business hours. Please give us 48 hours notice.